Munich, Markt Schellenberg, Unterberg, district of Berchtesgaden (June 8th, 21h). On Sunday, June 8, 2014, at 13:35 clock, an emergency call in the rescue coordination center Traunstein. An accident had happened in the “big thing” in the Untersberg mountain. The cave extends to approximately 1100 m in depth. A rescue operation is extremely costly and difficult. Based on current information, on Sunday, 06.08.2014 1:30 am in 1,000 meters of depth a 52 year-old caver got an accident. A companion of him got out of the cave to get help, a second companion remained with the injured. The attendant took about 12 hours for getting out and to make than an emergency call. Following his information the injured caver may not currently handle the exit itself. He is supervised by the remaining 38 years old team member. Were alerted cave rescuers of the Bavarian Mountain Rescue, Cave Rescue Baden-Württemberg and another cave rescue teams from all over Germany and from Austria as well. Additional the mountain specialists from the police, rescue teams from the Bavarian Red Cross and fire brigades from the surrounding areas were called to the rescue. Also a six-member team of mountain rescue Munich with cave rescue specialists are in use. 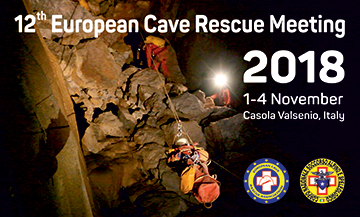 About the Mountain Rescue Munich more forces of the European Cave Rescue Association (ERCA) in Italy, Slovenia and Croatia were informed and could be alerted shortly. A team of specialists from Italy is on the way to the operation site. Overall, more than 200 operational forces for rescue are required. The preparations for the rescue operation is going on, including helicopter of police and federal police for the people and material handling. The insert is extremely difficult and can only be handled by experts in the field of cave rescue. The rescue itself will take several days because alone the descent to the site of injured collected about 12 hours and is currently not a technical contact from or into the cavity of the accident can be made. Around 4 pm today a preliminary rescue team has gone into the cave. In view of the long travel time we will not get further information before Monday 9th afternoon. We will inform about the progress and further developments of the rescue operation.